This is a Righteous Fire (RF) build that doesn't require any specific items or mods to sustain RF (you'll be able to sustain RF with only Normal items equipped at level 55 (sooner if you're close to your Holy Flame Totem)). This build is really easy to play. You just cast Holy Flame Totem at mobs or the boss and then move to the totem and help it burn everything with RF. Everything else in the build is automatic. This guide is written for those new to Path of Exile but layed out so the experienced players can skip to the good stuff. The reason that I write this part isn't so that you feel sorry for me but to explain why there are certain elements of my builds that are not maximized in a way that the general community would typically maximize their builds. As limiting as that seems, this game provides endless character building options. - Players that don't like button mashing. - Players that like playing with only one or two buttons. - Players that like a relaxing PoE experience. 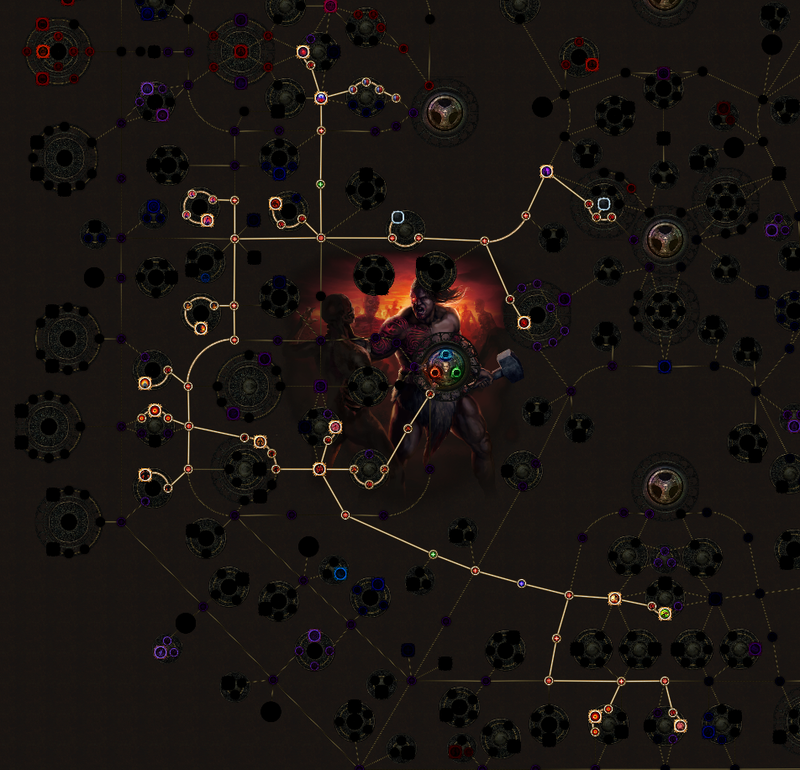 - Players that like the best builds ever made in the history of Path of Exile. This build is really easy to play. Sooooo easy. - Turn on RF, Purity of Fire, and Malevolence. - Cast Holy Flame Totem at an enemy. The totem will burn enemies and give you Consecrated Ground (Life Regen). This totem will do 100% fire damage once you get the Ngamahu ascendancy node. - Move to your totem to get the bonus life regen. When you aren't helping kill stuff, cast again. - Everything else happens automatically. - The curse that you choose will all be cast automatically via CwDT and Purifying Flame. Purifying Flame will also be putting Consecrated Ground everywhere. The more Life Regen available, the happier we are. - Wave of Conviction will be cast automatically for you. It's in this build to try and get a Critical Strike for you at least once every 8 seconds so you can get the bonus damage from Elemental Overload on the tree. The skill itself will also lower enemy fire resists by 25% (increasing the fire damage they take) of every enemy it Hits even though it does little damage at the level we have it. - As you kill burning enemies, you'll have an easy chance to automatically gain Endurance charges. If you want, you can use Enduring Cry to gain Endurance charges as well. Your Endurance Charges will give you lots of physical damage mitigation, bonus elemental resistance, and great life regen. - Enduring Cry is a great skill to use to keep up your Endurance Charges in boss battles that don't spawn extra enemies. - Your Stone Golem and Molten Shell will be automatically cast for you and will give you life regen and extra physical damage reduction respectively. - Purity of Fire reserves mana. This gives you fire resistance along with an increase to your maximum fire resistance. The latter is very important for sustaining RF. - Malevolence also reserves mana and gives a damage boots to our Damage over time. - So it's really easy! Move, cast once...move, cast once...move, cast once...Everything else is automatic. - The build has crazy life regen without RF turned on but the build has way more damage with RF turned on. But you could play Holy Flame Totem only if you wanted and the build would be fine. - Software: Path of Building - The character planner I use. Also, feel free to checkout my broadcast channel. Mixer keeps the last 14 days worth of broadcasts. I post all my broadcasts on my YouTube channel along with a few other things. It won't look legit but it is. Click the blue "download" button. Once downloaded, rename the file to whatever you like. Put the file in: Documents\My Games\Path of Exile. Once POE is loaded, hit "O" for Options, go to the "UI" tab, scroll to the bottom, and select your new filter from the drop down list beside "List of Item Filters". If it doesn't work, let me know. This is a SSF filter, not a "get rich" filter (though I get rich enough by selling what drops anyway). - It's POE's Default filter severely specified (and I jazzed up some of the graphical effects so that stuff is easier to see). - It'll show all: league specific drops, Divination cards, currency, maps , rare jewelry. - It'll show all: 5 linked items, 6 socketed items. - It'll show all small gear/weapons that have a red, green, and blue socket linked (vendor for a chromatic orb). - It'll show you only life flasks, and only the highest level flask for the area you are in. - It'll show all rare Sceptres. - It'll only show you the rares of the shields that have the implicit of 12% to All Elemental Resists or increases to Maximum Life. - I've included the Normal version of the Mosaic Kite Shield in hopes to chance for the Rise of the Phoenix. - For leveling you'll have the limited amount of rares listed above along with any gear that matches the linked socket combos you want (any rarity). These appropriately linked gear will appear until level 68 which is when most of the highest end of our rares will start appearing. By then you should have the currency to hesitantly craft decent rares that come across your path to start the slow progress of replacing and improving your gear. If you have any questions or see any issues let me know. I like to be able to just load the game and play. So I design my builds to not require any specific items or mods to function. Obviously you need the basics like resists and health but you’ll only need your Gems and your Passive Tree for this build to function well. So you can use ANY items you want to take the character in any direction. As the Guide Creator I’ll only be using rare items, just as a demonstration that you don’t need epic items to clear the Atlas. Please use any items you find/want. Righteous Fire(RF) can be over thought quite easily. I will simplify it. -It's a skill that, once it's turned on, is always on and can only be turned off in three ways: Dying, going through a loading screen, or using a flask that removes Burning (a flask of dousing). -It does fire damage to all it touches. -It is Damage Over Time, therefore it does not Hit. Many mechanics in this game require a Hit to be activated (such as Leech and Penetration). -RF burns you with fire damage. To sustain it, you need the highest Fire resistance you can get. Normal Fire Resistance is capped at 75%. Increasing the Fire Res. cap decreases the amount damage you take from RF. Life Regeneration takes care of the rest. -While RF is on, it gives you a boost to the spell damage of all your other spells. There are three types of Charges in the game. Each character has a default limit of 3 for each type. We'll be focusing on Endurance Charges. Endurance Charges give 4% physical reduction and elemental resists per charge. Ours will also give us life regen. We'll be picking up a few nodes on the tree that'll increase our max Endurance charge limit up to 6. Depending on the method that you earn your charge, you may earn only one, or a whole bunch at a time. Charges have a duration. We'll get ours as high as we can. While you have Endurance Charges, earning any amount of Endurance Charges will refresh the duration for ALL Endurance Charges (they all share the same duration). Cast when Damage Taken (CwDT) is a gem that automatically casts linked spells (not attacks) when your character takes a certain amount of damage. The lower the level of CwDT, the less damage it needs to cast its linked spells. The higher the level of CwDT, the more damage it needs to cast linked gems. CwDT cannot support ACTIVE skills with a higher player level requirement than that of the CwDT gem itself. For spells to be cast by CwDT, the spell has wot be within the requirement level listed on the gem. As you level gems, you'll see that they all have certain player levels you have to be at in order to use them. CwDT does too. You'll notice in the CwDT gem description that it'll only cast spells under a certain requirement level. That requirement level goes up as CwDT levels. Linked SUPPORT gems have no boundaries and can be fully leveled. The benefit to a high level CwDT at a high level is that we can have high level gems attached to it (Stone Golem). The benefit to a low level CwDT is that you can have spells being cast frequently. Good for utility spells (applying curses and such). You can't manually cast spells that are linked to CwDT and within CwDT's gem requirement level. Curses are debuffs that you can put on an enemy. There are quite a few curses in the game, not all of them are beneficial to every build. In this build you can pick anyone you want. By default in POE, every character can only apply one curse per enemy. There are ways to increase this limit, but we won't be with this build. Unless an enemy is "Hexproof" (curse proof), our curse will have full effect on all enemies that aren't bosses. Curses are 33% less effective against Area/Map bosses and 66% less effective against the Shaper and his Guardians. Vaal skills are super versions of normal skills that have a duration and cooldown given to them. We're hoping to use Vaal Righteous Fire. Early on in the game Vaal skills typically only drop in Corrupted areas (though as the game progresses you'll find them a little more often.) Corrupted areas can be randomly found attached to maps as a side area. Kill the boss inside these areas, loot their "stash", and hope you get the vaal skill you want. Vaal RF gives you both the RF skill and Vaal RF in one gem. Both skills require their own key bind/button. You can use RF like usual but the Vaal skill requires you to kill enemies, or damage Rare or Unique enemies. Once the skill is ready to use, you can use the skill anytime. But remember, any loading screen in the game automatically resets the vaal skill and it needs to be refilled. So don't save it too long (boss arena doors don't have load screens (except for the The Lord's Labyrinth). Once the skill has been used it'll have a short duration where the skill can't refill. Vaal RF takes a chunk of your health to cast but doesn't constantly hurt you like the normal RF does. It then does insanely good damage for a duration, then expires and needs to be refilled. Pro - As cheap as you want it to be! No uniques required! Pro - Perfect for new players. Easy to level, easy to survive, easy to kill, easy endgame, easy solo self found. Pro - It clears maps quickly. Pro - Has great DPS...I'll update the numbers once Path of Building is up to date. Pro - Amazing life regen. Pro - Only need to focus on Cold and Lightning Resists. Fire is taken care of without gear. Pro - Only one 5/6 Link. Easy links to achieve. Ha ha ha! It's a link! - With the provided tree, select all the nodes as they come. Get all the south nodes, then work your way up. - Equip and start leveling your Stone Golem as soon as it's available. - Equip and start leveling your Purity of Fire as soon as it's available. - By the time you kill Arakaali (the Spider Boss in Act 7) you can select the Pantheon option that unlocks (Soul of Arakaali). Have that and the minor God, Soul of Abberath selected. - Doing the first two Ascendancies wouldn't hurt either, but it's not required to simply sustain RF. You can sustain RF with gear in other ways of course, I just thought you'd like to know the soonest you can run RF no matter your gear. And it's WAY EASIER if you stand in Holy Flame Totem's Consecrated Ground. You'll start as a Marauder. We start as a Marauder because there is only one subclass in the game that greatly increases our natural life regen. That's the Chieftain subclass (ascendancy). And to get there, you must start as a Marauder. The Chieftain also had some very compatible nodes for easy caps to fire resist (for RF) and very offensive perks for a physical skill like Holy Flame Totem. This build really benefits from every node we'll select on the tree. I strongly suggest taking every node as it comes up, not really skipping anything. Go south first and then get every node/section as you cross it. - Life Regen - The more the merrier. We want lots to sustain RF, but even if you feel like only running with Holy Flame Totem, it's awesome to see your life move up so fast without flask help. - Maximum Life - Besides the obvious factor of "the more you have, the better...", the more life you have also improves the damage of RF. - Endurance Charges - The tree gives us nodes that let us increase our maximum endurance charges from 3 to 6 :). It also gives us increases to Endurance Charge duration and life regen per charge. - Fire Damage - All the damage nodes are at the end of the suggested path. But that's ok. You'll actually find the build strong enough without them and the damage you get in the high levels from the tree is just a bonus. There are great perks there for sure...but it's just bonus damage. - Jewels - Jewel slots are amazing. Jewels are items you can find that you can actually allocate on your tree. They can give almost anything from health, damage, resists...anything. We will only have 2 jewel slot selected :(. You'll have free reign with with both of them. What's really neat is you can swap jewels in and out of your passive tree anytime. Don't forget about attributes. The tree almost provides all the attributes we need for our skills. We'll be 4 Dexterity and 11 Intelligence short. You'll pass some nodes on the tree that give +30 Attributes. If you don't have items to cover what you're short in, feel free to select some of these as you pass them. You'll get respec points that will let you remove them later once you have better gear. Now, feel free to modify this is anyway. This is just my preference for easy Solo Self Found. Take your time to look at each skill as they come along. Some of the nodes are pretty dramatic. Some quests earn you respec points in case you regret any decisions you made on the tree. You can also use Orbs of Regret for the same thing. - 1st Two Points - Tawhoa, Forest's Strength. It's all about Endurance Charges and Life Regen. - 3rd Two Points - Ngamahu, Flame's Advance. This is big for your totem. You get lots of offense but it also converts 50% of Holy Flame Totem's physical damage to fire...making the totem to 100% fire damage. - 4th Two Points - Hinekora, Death's Fury. Another busy node :). RF doesn't Hit an enemy. Holy Flame Totem does though. With this node, we have a chance to cover a boss or rare (yellow) enemy with Ash. When an enemy is covered in Ash, they are have 20% less movement speed and take 20% increased fire damage (all our damage will be fire eventually). We also will get 1% of our totem damage as life leeched back to us and 1% of all fire damage leeched back to us. RF does not Hit so we will not Leech via RF. - Major God: Soul of Arakaali - It's only for the first perk. The 5% reduced Damage taken from Damage Over Time means we take less damage from RF. - Minor God: Soul of Abberath - Only beneficial while we're moving. But it's safe to keep moving that to stand still so I chose it over the life regen of the Soul of Tukohama. PoE restricts which gems are available to each class until Act 3. Until then you can get some gems for free from quest rewards, purchase some from specific NPCs in each town, or find them as loot. There are two NPC's that sell all purchasable gems: the first one is Siosa in the Library in Act 3 (you have to do his quest first (the Library is connected to The Imperial Gardens)), the second NPC is Lilly Roth is Act 6. Level all these gems to their max (level 20) unless I have written a level number beside the gem name. For example: "-Cast when Damage Taken (Level 1)". If I have written a level beside the name, that's the level you need to stop leveling the gem at. -Holy Flame Totem Just as a heads up, this skill is weak at first, but gets MUCH stronger as it levels (gem level 18+) - This totem Hit will eventually do 100% fire damage once you have the proper ascendancy nodes. It'll hit enemies with fire and cast Consecrated Ground around itself (which gives 6% life regen, removes all curses, and gives increased crit chance (Wave of Conviction)). Consecrated Ground impacts you and your allies (including your totems). HFT channels 3 projectile flames at once but each totem can only hit an enemy with one projectile. -Multiple Totem Support - Lowers the totem's damage by 21%, but let's you have 3 totems out at once. So we lose 20% damage for one totem, but then get three totems doing 80% damage. -Combustion Support - Bonus fire damage and increases the chance to Ignite enemies. -Immolate Support - Grants extra fire damage if the enemy being hit is burning. As a 5 link, Holy Flame Totem has a 94% chance to ignite and RF always burns...so this is a safe bet. -Controlled Destruction Support - Lowers the spell's Crit chance, but greatly increases its damage. We don't care or focus on Crit for this totem so the bonus damage is welcome. -Concentrated Effect Support - Greatly increases damage at the expense of decreasing our AOE. -Burning Damage Support - Extra damage. -Elemental Focus Support - Greatly increases damage at the cost of not being able to put an ailment on an enemy. This seems like it would negate RF...but RF doesn't inflict an Ailment. It skips the ailment and jumps straight the the effect, burning. Typically, if you were to throw, let's say a Fireball, at an enemy, it would have a chance to ignite. If the enemy ignites, they start to burn. So if you had this support with Fireball, you'd never burn an enemy. You'd only hit them with fire damage. RF simply burns enemies. It doesn't have a chance to ignite. It skips the "chance to ignite" mechanic and just burns (damage over time). So this is a damage boost with no consequence. -Cast when Damage Taken Support (Level 2) - Automatically casts linked spells. -Curse on Hit Support - This is needed to be able to apply Enfeeble on enemies with Charged Dash. -Any Curse You Want - I personally prefer Enfeeble for the defense it gives. It that makes enemies less accurate with Hits by Attacks (not spells), deal less critical damage, and deal less overall damage too. Here's a list of curses if you want to pick your own. -Enduring Cry - Gives an instant boost to Life Regen for a small time but also adds/refreshes our Endurance Charges. Good to use in a boss battle to keep your Charges up. -Cast when Damage Taken Support - Automatically casts linked spells. -Summon Stone Golem - An minion that provides life regen to you. The more life regen the better! -Molten Shell - When activated, gives us bonus armour (physical damage mitigation). After it's mitigated a certain amount of damage it'll explode. -Cast when Damage Taken Support (Level 1) - Automatically casts linked spells. -Increased Critical Strikes Support - Just helps increase Wave of Conviction's Crit Chance. Short Version - ANYTHING YOU WANT! I like having a shield and one-handed weapon instead of a two handed weapon. It's just a preference; no right or wrong there. - Weapon - Anything you like. - Shield - Anything you like. - Head - Anything you like. - Chest - Anything you like. - Hands - Anything you like. - Feet - Anything you like. - Amulet - Anything you like. - Ring - Anything you like. - Belt - Anything you like. - Jewel - Anything you like. - Flasks - Anything you like. I simply use 4 health flasks (3 that remove bleeding and 1 that removes burning) and a Quicksilver Flask that removes Chill/Freeze. If you’re new to PoE, check out the Tips for New Players section above. It gives lots of help on gear, currency, leveling, and endgame mapping. The beginning of your first playthrough, or with SSF, can be hard gear wise. Hang in there, the good gear with the links you want will come. Don't waste your currency (orbs and fusings) on your items until you reach endgame. It might seem like you have a lot, but soon you'll see that it takes a lot of currency to get what you want on an item. Some people say to ignore chaos resists. This is not bad advice but you'll have 10 rare items to get 135% resistance on all three elements and chaos. It's doable...and so relaxing when accomplished. I say 135% resists because by the time you finish the story and get to endgame, POE hits you with a -60% to your fire, cold, lightning, and chaos resists. It is very important to have those capped at the +75% or more. It's not a waste to go over the 135% as some endgame map mods will lower your resists by another 60%. I have included an item filter (in the URL section) that will ease the looting pain for those that do SSF. At the end of the game, the levels (maps) you try and clear will have random modifiers (mods) allocated to them. There are A LOT of mods that can go on a map. There is only one mod that we can't run: The No Mana and Life Regen mod. We need mana for our totem and our movement skill. We need Life Regen for RF. But that's it! Just the one mod! - Negatives to maximum resists hurts RF but not our totem. - Slower mana and life regen hurts RF and but only impacts our totem a little. You'll learn your personal preferences over time, but only No Mana and Life Regen should be avoided. - I suggest doing every quest in the game. It doesn't take long. If you're too eager to get to mapping in the endgame, here is a link to all the quests that give Skill Points as a reward. Bandits - With the Bandits in Act 2, I kill them all for the extra 2 skill points. You, of course, do what you like. **Remember to prioritize. You may not be lucky enough to get the gear that'll let you play with all your gems as soon as they are available. So do what works best for you until the gear comes (don't be quick to sell your old gear in case something doesn't work out). - There are two NPCs that sell all purchasable gems: the first one is Siosa in the Library in Act 3 (you have to do his quest first (the Library is connected to The Imperial Gardens)), the second NPC is Lilly Roth in Act 6 (Do her quest in Act 6). Awesome. So if you have any questions let me know and I'll respond the best I can. If you have questions regarding your setup (gear, gems, or passive tree) please ensure the Characters Tab in your PathofExile.com privacy settings is set to public (not hidden). This will allow myself (and those who would like to help) to view your character details more thoroughly. OH! Don't forget, to support GGG by buying a skin for all your favourite skills you use. They last forever, you look rad, and it keeps POE going too :). I won't have much personal time to respond until the end of March. I'll read all the replies and do my best to respond when I can. My replies may be short and sweet though as I'll only be online via phone until April. Thanks again for trying the build. I hope you enjoy it. I still have a few details to finish up as the hard working community finishes up completing their tools (Path of Building and Filter Blade). 3.6 is A LOT of data to change. Once these tools are updated, I'll be updating my guide as soon as possible. I'll reply to the guide to let you know specifically what I've updated. Which links do you recommend with Holy Flame totem ? (I'm not sure Path of building will be update before the season start). This build can do Shaper and Uber Elder ? Immolate, Combustions, Added Fire Damage, Fire Penetration, Iron Will. In regards to Shaper, I assume so. Holy Flame Totem is a new skill. But the build with also the same setup was great in 3.5 and damage wasn't an issue at all. If you have any questions as you go along feel free to ask. I added some suggested support gems for Holy Flame Totem until our hard working community tool creators have updated their tools. Both Passive links to poe website passive page are warning about "This is 3.4.0 Passives", fyi. Ya, the tree is the same from last league. The picture and links will be updated once PoE has stabilized their release. Thanks for letting me know. You can go ahead with the tree as currently posted. It'll be staying as is. Just FYI, I updated the Picture of the Passive Tree, the links to the Passive Tree, and added the 3.6 filter. Pastebin will be added when PoB addes Holy Flame Totem to its database. Thanks a lot for this build! I am gonna build it on marauder as my league starter, and my league starter is always my league finisher lol, i don't do the multiple toons thing.